Ascending Butterfly: Monday, January 18, 2010 - Today's Words of Inspiration and great giveaways! Monday, January 18, 2010 - Today's Words of Inspiration and great giveaways! Happy Martin Luther King, Jr. Day! Did you know that Martin Luther King, Jr. Day is one of four United States federal holidays to commemorate an individual person? (The other three federal holidays honoring individuals are Washington's Birthday (often called President's Day), Columbus Day, and Christmas.). King was the chief spokesman for nonviolent activism in the civil rights movement, which successfully protested racial discrimination in federal and state law. And while he was assassinated in 1968, his legacy lives on. For those of you that do not have the day off today, you can still be a 'Change Agent' today, just pro-actively decide to do something today to make your neighborhood better, to make your City better, to make your World better! From large scale to individual you can make something better for someone today. Do you have an elderly neighbor who doesn't get out much? Maybe you can add their grocery list to your own, or accompany them on their errands today. Do you have a sick neighbor or co worker who could use some chicken soup? Have you made your donation yet to help those in Haiti? Hopefully we will all aspire to be 'Change Agents' on a daily basis, but making today the day you begin, couldn't be more profound and couldn't be more perfect! You can visit Serve.gov to find a volunteer opportunity in your community and for learning more ways to continue to Serve After King Day. Great refresher on Google Friend Connect! 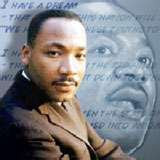 Dr King Cleared a path for us that many never thought possible. I only hope that one day everyone will share in his vision. The way things are now, A lot of people share his views but unfortuanely many still dont. I pray for us all to become one and to realize in the immortal words of WIlliam Shakespear that if you prick any one of us, we all bleed.